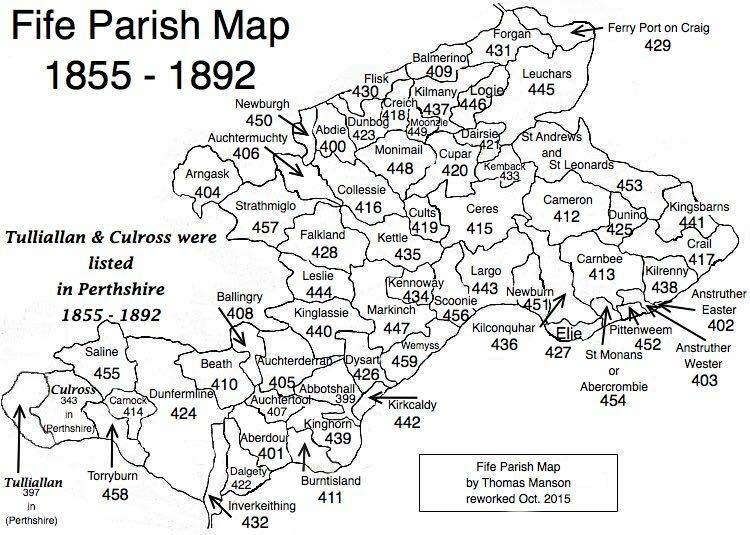 Parish of Auchtertool – The Fife Post………..for genealogy and historical information. AUCHTERTOOL, a parish, in the district of Kirkcaldy, county of Fife, 4 miles (W. by S.) from Kirkcaldy; containing the village of Newbigging. This place is supposed to derive its name, signifying, in the Gaelic language, “the high grounds on the river Tiel,” from its elevated situation with respect to that stream. The church, which was substantially repaired in 1833, is situated within a mile of the village, and is adapted for a congregation of about 300 persons. Auchter is said to be a Gaelic word signifying a height and Tool seems to be a corruptioin of Tiel, a rivulet which rises in the parish and runs through it; hence Auchtertool signifies the higher grounds on the Tiel. There are several streams in the parish and a loch called Camilla situated near the east end of the parish. Livestock in the parish consists almost wholly of horses and black cattle. There is one farm on which Cheviot sheep are bred. The usual crops are raised in the parish including potatoes, turnips, oats, wheat, barley, and hay. There are several whinstone quarries in the parish as well as a freestone quarry and a limestone quarry, for the use of the tenants of the land owners and not sold. There is an extensive brewery in the village of Auchtertool which has been long in good repute for its products which are shipped as far away as London. The population in 1801 was 396 and in 1831 was 527. The increase can be attributed to improvements in agriculture and in the roads. The average number of marriages for the last 7 years was 6 and of births was 11. No registers of deaths are kept. The number of families in the parish is 125 with an average of 3 1/2 children. In the last three years there were 4 illegitimate births. There are two villages in the parish, Auchtertool and Newbigging, with populations of 329 and 75. The number of families attending the Established Church is 92, and those attending the chapels of dissenters and seceders is 23. There are three schools: the parochial school, a private school and an infant school. The average number of children attending the three is 150. There is a parish library established in 1824, and there is a savings bank. There are no inns but six ale-houses. Fuel is the coal used in the parish, taken from colleries within or nearby the parish. The above extract is taken from the account written in November 1836.